Get this thing off of me! Yarn: ONline Linie 76 Cup, color 06 (52% schurwolle, 48% polyacryl). Total of 9 skeins (with only a yard or so left over!). I absolutely adore this yarn, it has such personality. As I was knitting, I found myself looking forward to funky yarn sections, and crossing my fingers that they would end up front and center, not at the edge :). Needles and gauge: US 9 Addi Turbo, 15 sts/22 rows per 4” square. Finished measurements: 37” bust, 22.5” shoulder to hem. I wanted to showcase the lovely yarn. I whipped up the pattern in a very short amount of time. I am sick and tired of dealing with complicated sweaters. 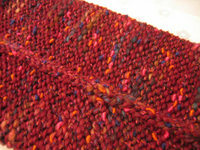 The edging at the hem and sleeves is 1 row of purl on the right side. That’s it. 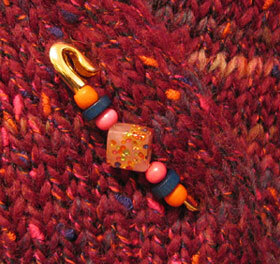 The edging along the sweater opening is a modified i-cord designed by Annie Modesitt (more details here). The neck opening in the back has just a little bit of shaping and no edging – I picked up some stitches, and then bound them off on the next row. The right and left fronts are mirror images of one another. So are the two sleeves ;). The sleeves are hardly shaped: 1/2″ decreased at the forearm, then 1.5″ increased to the armpit. There is no hip/waist/bust shaping. At all! Because the wrap fits snugly around my body, I didn’t think it was really needed. Now that the wrap is done, there’s only one place where just a few decreases would have been an added bonus – above my beeee-hind ;). I didn’t wet-block this as I typically would. Instead, I ironed it on high with high steam through a thin pillowcase. Let me tell ya, if there’s one thing I know, it’s how to iron (thanks, Mom and Grandma!). The fabric stretched slightly after ironing (my sleeves are a bit longer now), but it’s not a big deal at all considering that in a chunky garment like this, flat seams take off the 10 pounds the camera adds and then some. There is one button securing the “under” front, and no other buttons or ties. I know, not very creative – it totally matches. I did play around with other color arrangements, and I must say, dark green looks great against the color of the sweater, but I was tired, hot, and cranky, and the store was amazingly crowded (with tourists, toting around huge shopping bags, I just don’t get it! ), so I caved in and matched. Do I love it? Yeah! I mean, I think so… ask me again when the weather has cooled down by at least 20 degrees ;). Seriously, the ironing made all the difference. Before, the wrap just sort of sat on my body with every seam protruding half an inch into the air. The hems and edgings curled slightly in an unflattering way, and the doubled fabric on my belly really stood out. After, the fabric is thinner, the seams are flat, and the wrap really follows the lines and curves of my body instead of just sitting there. P.S. Always fill your iron with bottled or filtered water – the mineral deposits in tap water clog up the steam vents and cause nasty white chalky crap to be spit up all over your stuff. And it’s hell to get out of handknits ;). OH, it’s just gorgeous…great job! I am totally giving you a standing ovation on this sweater! I must admit, it is one of the most flattering, beautiful sweaters I’ve seen on someone’s blog! To color is wonderful and I love the pin. All that added to the fact that you made it up yourself? BRAVO!!! SG, once again you’ve scored a winner! It’s a lovely color on you and the fit is just great! One of these days I will *actually* get started on a sweater or cardi for myself out of all the projects on my WIMs list and in my stash. I hope your consulting rate isn’t too high. LOL! The wrap sweater is amazing and so very flattering. The vertical DIY pin is the perfect finishing touch. I love it. You look so slinder and beautiful in that color and shaping. I would love the pattern. Maybe you would be willing to share it sometime???? It turned out fabulously! I love it, its looks great on you. Love the pin…perfect. Bravo! Wonderful job! I can’t believe you could knit this in all this heat, you are amazing. Very flattering pattern and the colorway is beautiful. Lovely sweater and the pin is very nice and perfect for the sweater. Nicely done. Oooooh, I like, I like! You look fantastic in this color and shape. Well done, you. And thanks for the tip about the water in the iron; I’ve been wondering why my iron spits white chalky stuff out. Ta da! yeah! congrats! you look great and the wrap cardi is fantastic. i hope you’re proud of yourself! It looks fabulous, Kathy! Congratulations. It fits you perfectly! All work paid off, eh? the wrap cardi looks fantastic! congrats on a wonderful job! Absolutely fabulous! I hope you actually wear this one! I have been waiting for the finished results, and it is breathtaking. I love it. I love the added touch of the pin. It is a hit! I hope you enjoy it. Your wrap is really cute! The color really compliments you. And the yarn is beautiful with its’ flecks of color here and there. i can’t believe you knitted and finished your wrap cardi so quickly. it looks absolutely fabulous! Your wrap turned out beautiful! I love the DIY pin–a perfect match. The color and the style are just lovely. Love it! The fit is dead on. Nicely done. You even look like you might be smiling in the photo. You knitted my dream sweater. Love it. I have to agree … the colour is absolutely lovely! I know you are happy with the sweater … you smiled! Keep on smiling, girl! Woo! It really does look nice.. and I totally know what you mean about the weather.. That’s the only thing that’s been stopping me from modeling my sweater for a picture.. I just can’t see wearin it for more than 2 seconds in this heat. Can’t do it! You did it again! The sweater is gorgeous…you look soooooo happy! That design is very flattering on your figure. Today, however, was indeed not its day. The sweater came out really nicely! It looks great on you. The ironing really paid off, I guess, because it hangs very nicely and, as you say, doesn’t look bulky or curl up at the hem. And I love the pin you made. Green might have been nice too, but I like the matching color. But maybe you could make a second pin and have a whole pin wardrobe to go with the sweater. I’m impressed that you designed this yourself! Yeah, it’s fantastic all right, and it looks perfect on you: shape, color, sizing. LOVE the pin! I had the exact same experience at Beadworks! Tons of people, all with big bags and backpacks, sweltering heat. Bleh. If you ever need to go to a bead store again for any reason, let me know – I know a super one on the ocean, huge with no crowds. It would be a great “field trip”. Ok, now I am inspired to rip out the shoulder seams, frog the fronts and do it all over! It’s not so bad when you love the yarn. Love love love this sweater! Want to make it for myself – and I never find a wrap I like. When the weather returns us all to a normal orbit, will you consider writing up the pattern for us less talented types? Pleeease (said with a whine. its too humid not to whine). The cardigan is great, the best quality it is the fit. 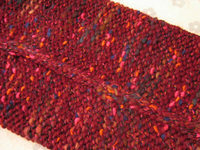 Your work inspires me, I made the same front edging in my recent project and it´s perfect. I´ll send you a photo, and I have finished my tivoli too. Your designs are really great. Looks good on you! It’s amazing how you always manage to pull off a pattern so well and so quick! You go girl! Gorgeous! That is really so flattering. The color is perfect for you and the fit is so nice. 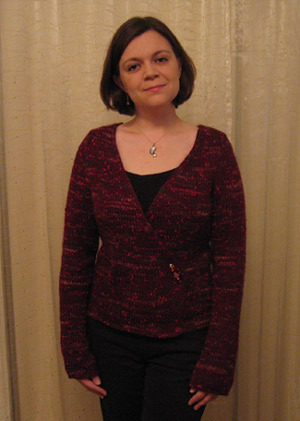 Cardigans usually end up looking boxy and frumpy on me — maybe because I have never made one for myself. Yet another thing to put on the “to-knit” list! Such a beautiful sweater! It looks like it fits just perfectly. And the color is fantastic. I never cease to be amazed at your knitting skills! Fabulous! And the pin matches perfectly. I think that you’ll be wearing this sweater a lot this fall and winter. it looks great! i love the lines of the wrap and how they fall in just the right spot so they’ll stay where they should. nice work in figuring that out. Omigosh Kathy, it’s gorgeous! Very flattering — you did a fantastic job on the design and shape. I bet you can’t wait for fall to come…. Very pretty! That yarn is so neat. I have a sweater in it in green and sometimes I just stare at it, cause there’s so much going on. What a fun yarn for such a simple, elegant sweater. Perfect on you! You should “prance” around. Maybe today will be better for that though. Kathy, the sweater looks wonderful!! Nice job. And thank you for the tip about using filtered/bottled water in the iron. Beautiful! Wear it lots this winter as it fits you wonderfully! I love it! It looks great on you! Oh MY! It’s finished! And it looks GREAT! You know, it just looks like such a satisfying knit. Know what I mean? Like, it all just came together. I absolutely love it! You are so very talented! Hot damn! Great looking sweater with an awesome fit! WOW!!!! Love it! You have out done your self again! Will you be sharing this pattern?? Perhaps a submission to one of the magazines? I agree with you on simple patterns. As usual it is perfect! You constantly amaze me! please post additional pictures. it is a little hard to see the finished shape of the sweater…. great job. It’s so stylish! I love the color and the way it fits. Gorgeous! Wonderful job! You look great. Your sweater turned out so well. It is absolutely gorgeous on you! Be proud! Ever think about making your pins and selling them? What a great sweater! It turned out wonderful! Will you be selling the pattern? Wonderful results! I love the way that yarn looks too. Great work on another great pattern. This looks terrific. You conquered the wrap sweater! That looks adorable on you! You really did a great job, and that yarn is fab! Wow, it looks great! I love the fit, the sleeve length, and the yarn color. Very sophisticated. Congrats on another beautiful pattern. It looks great. Where did you find the yarn for it?